Australians love folk heroes. Victorian bushranger Ned Kelly has become a legend for his exploits, with books and films created to feed the story of the Kelly gang and their armed political struggle in the late 1870s. Less well known (or at least less celebrated) is the story of Jandamarra, an Aboriginal folk hero with a story no less compelling – or tragic – than that of Ned Kelly. Jandamarra lived in the remote Kimberley region of Western Australia in the 1880s and 1890s and his story is told on tours to Tunnel Creek, which is part of the Bunuba people’s land, 145km (or two hours drive) from Derby and and about 370 km (or 5.5 hours drive) from Broome. I learned this story on a visit to Tunnel Creek with Kimberley Wild Expeditions, told to us by Bunuba elder Dillon Andrews, whose Bungoolee Tours leads visitors into the underground caverns of Tunnel Creek. It is a story that has been handed down by elders whose parents and relatives lived and walked with Jandamarra. The story goes like this. Jandamarra was six years old when white settlers arrived in his home country between the Oscar and Napier Ranges. By the time he was a teenager, ready to be initiated into manhood, tensions between the settlers and the Bunuba people were growing. Sheep and cattle were grazing on Bunumba land, and the indigenous people saw them as a source of food. Aboriginal people were being press-ganged into working on the cattle stations and Jandamarra became one of them. He quickly became a skilled shearer, horseman and rifleman. While working on Lennard Station, Jandamarra became friends with a white man called Richardson, who later became a policeman. Richardson recruited Jandamarra to be a tracker for the police, and they soon had a reputation as a formidable team. But when Jandamarra was caught spearing cattle, he was flogged and jailed. But later, he returned to work with the police, and with Richardson. In 1894, the pair were sent on a mission that would end in tragedy for both men.They were charged with tracking down and arresting a group of Bunuba people, including Jandamarra’s uncle Ellemarra, who had helped Jandamarra prepare for initiation into Bunuba manhood. The group was caught deep in Bunuba country, and held captive at Lillimooloora Station before being sent to prison. 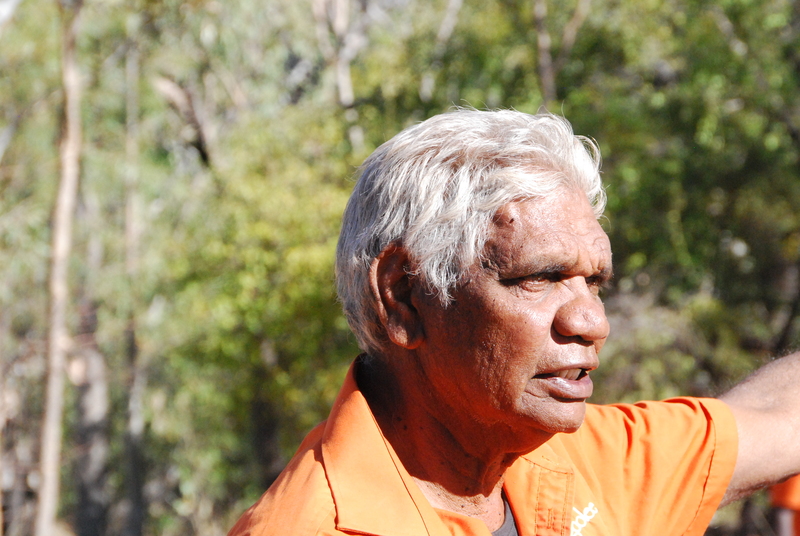 As Richardson slept, Ellemarra spoke to Jandamarra, reminding him of his responsibilities as a Bunuba man to his people, his country and to himself. Presented with choosing between his friend or being an outcast to his own people, Jandamarra saw no choice; he killed Richardson and set the captives free. Within a week, the group had killed two drovers and stolen weapons and ammunition. They were outlaws, and were soon battling troops within the sacred Windjana Gorge. Ellemarra was killed, but Jandamarra escaped, hiding out in the caverns of Tunnel Creek. As the police staged savage reprisals on Bunuba people, many of whom were massacred, Jandamarra took a different tack and challenged the police to catch him. For three years, he evaded and taunted them, and his legend grew. He became known as a Jalgangurru, a man of magical powers, able to disappear at will. The people in the area believed that only another Jalgangurru could ever catch and kill Jandamarra, who fought tirelessly to keep white settlers out of the land around Tunnel Creek. It was an Aboriginal man from the Pilbara, a long way south, who finally gunned down Jandamarra in the hidden depths of Tunnel Creek in April 1897. Today, Jandamarra is remembered as a freedom fighter and a champion for his people. Sometimes he is referred to as the “black Ned Kelly”, an outlaw who struggled against authority. 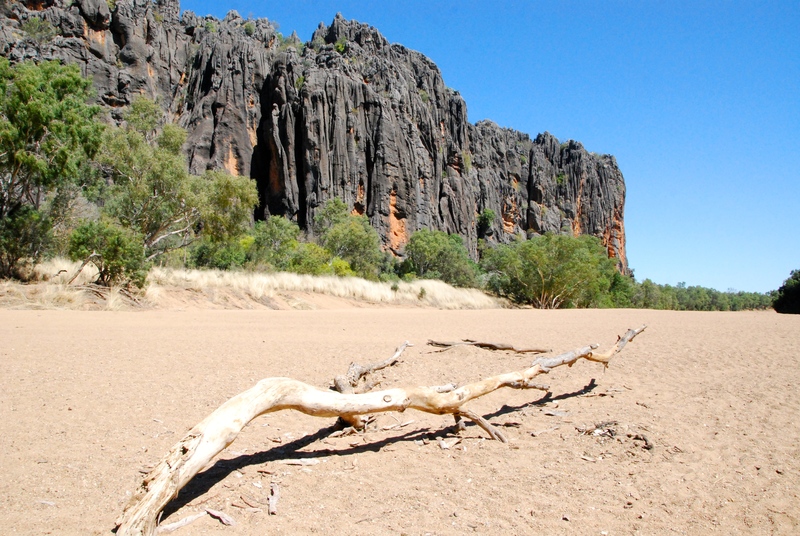 It’s a stirring story, and as we travel along the Gibb River Road, we are soon in the heart of Jandamarra’s country. We stop and walk beneath the 90-metre high walls of the Windjana Gorge. 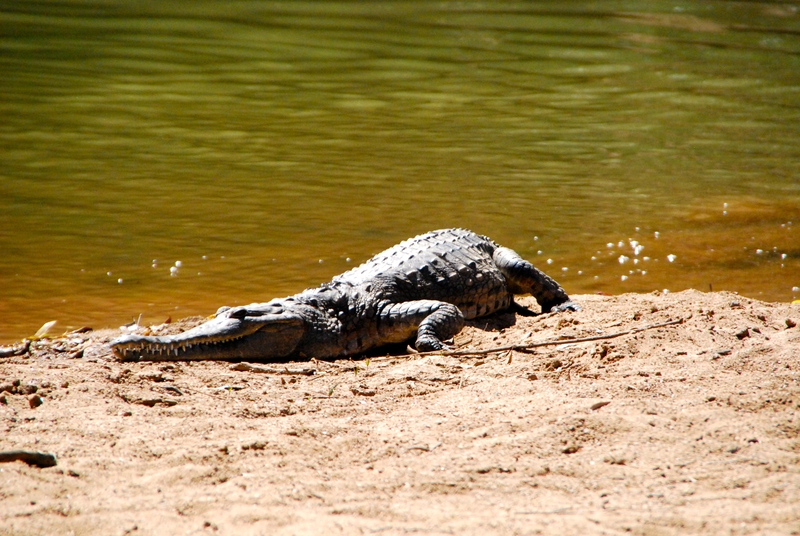 The gorge is an oasis that stretches 3.5km, where freshwater crocodiles bask on the banks of the Lennard River. I keep my distance! 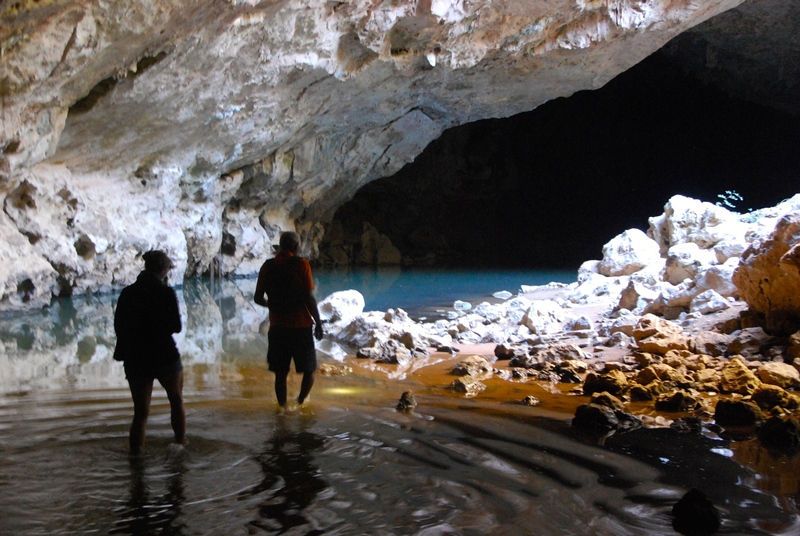 At Tunnel Creek, we take off our shoes to wade through the chilly water in the 750-metre cave system carved through the Napier Range, the place where Jandamarra “disappeared”. Tunnel Creek flows through a tunnel beneath the Napier Range, part of a fossilised barrier reef dating back 360 million years. Fossils can be seen in the walls of the tunnel, which also hold rock paintings, reminders of those who’ve been here before us. 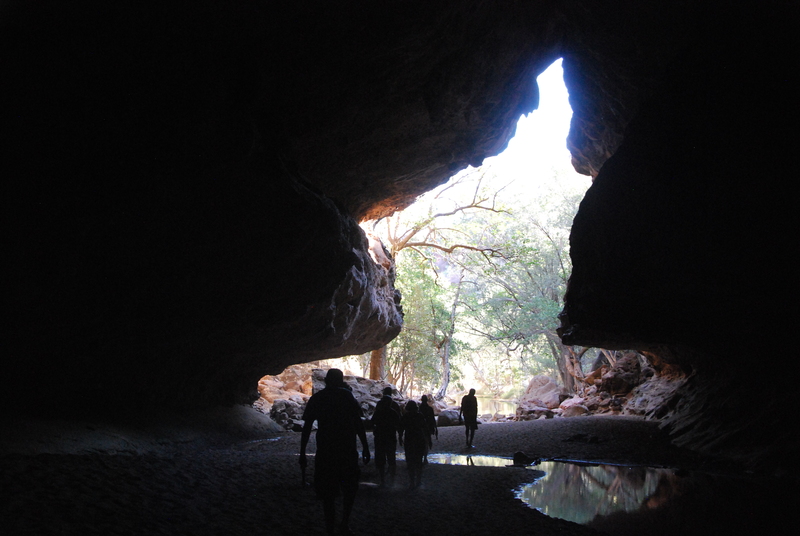 At the end of the tunnel is a waterhole where some take a dip (too cold for me!). Heading back to Broome, with the story of Jandamarra’s life and death still fresh in our minds, we make a brief stop at the ruins of Lillimooloora Station. The sun is setting, and its an eerie but fitting place to remember the life of a man who fought for his people and their country. A Glass Half Full travelled as a guest of Kimberley Wild Expeditions. What massive caves and fascinating story. I’m not so sure about the crocodiles though I must say. Well, they are freshwater crocodiles and considered harmless (unless you provoke them). Not like saltwater crocs, which will finish you off in a flash. But nevertheless, I’m wary and prefer to keep a respectful distance! A snappy story. Well done. I’m going. Watch out for the crocs. You’d love it.